Following a discussion at work - If you can eat frogs legs - what happens to the rest of the frog? do they eat it? do they grow back? and why has our security man got no sense of humour!!!!! Why has our security man got no sense of humour!!!!! ................... well possibly but the jury is out on that one! what restaurant is that????? cos whatever it is - we dont want to go! You can snog me any time. You should see the reaction when the frog licks back :w00t: my treat, lick lick lick, crispy fly anyone? They should make little wheel chairs, so frogs can go on DLA and have a brand new cars and never have to worry about the next payday. so is that where the phrase you have to kiss a lot of frogs before you find your handsome prince comes from??? 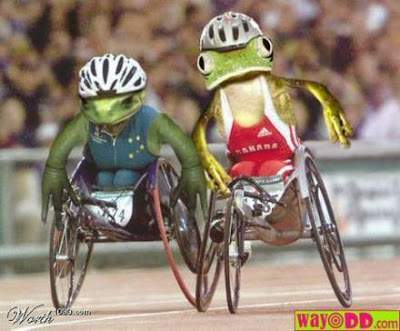 They should make little wheel chairs, so frogs can go on DLA and have a … They should make little wheel chairs, so frogs can go on DLA and have a brand new cars and never have to worry about the next payday.